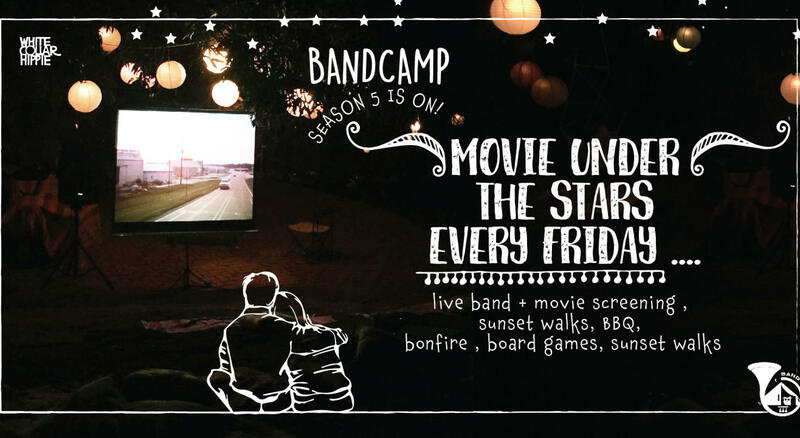 BandCamp Talkies is our own little way of helping you reconnect with cinema out in the open in a beautiful camping environment. Also, since the venue is BANDCAMP, there is going to be some great live music before the screening :) You can expect the movies to come from a mix of world cinema, classics and crowd favourites. The band before that will be indie, blues, retro music and so on! There will also be bonfires, a barbeque, sunset walks, and some great food! The campsite has large grounds and we’ve added hammocks, books, and games to ensure that there is something for everyone. A stone’s throw away from the city (clock says 60 mins! ), BANDCAMP is located off Gorai beach. The layout is such that you can enjoy nature and have your privacy even though it’s a bustling campsite. Expect tents, sleeping bags and camping goodies, unwind in the main area or walk around the fishing village down to the sea anytime. Since Uttan is a coastal town (home to the Koli community), meals are freshly made by locals. BandCamp is best suited for groups, solo campers, families, corporates, couples and pets. Basically, EVERYBODY! You can even attend our Movie Nights or weekend workshops on Capoeira, Photography, Fitness, Poetry and so on. Llewyn Davis, a former merchant marine, is a folk singer from Greenwich Village, New York City. He struggles to maintain his artistic independence against the commercial needs of the music industry. A multi-genre song man with the heart of a storyteller! Akash has a wide range and usually plays solo or with a 3-4 piece band.